As we pile our plates high with turkey, stuffing, and mashed potatoes this Thanksgiving, we wanted to remind you about an often-overlooked health issue for many seniors—oral health. Before you gather around the dinner table this holiday season, make sure your loved one’s mouth and teeth are healthy. Poor oral health can affect more than not enjoying a meal but can be detrimental to their health. It can contribute to weight loss, malnutrition, dehydration, sleep issues, pain, and more. What are some of the concerns with poor oral health? Oral and pharyngeal cancer. Every year, about 35,000 cases of mouth, throat, and tongue cancer are diagnosed. According to the American Cancer Society, the average age for those diagnosed with these types of cancer is 62. During regular dental appointments, a dentist can check for signs of oral cancer. These check-ups are critical for early detection. Often, the early stages of oral cancer are not painful and may be difficult to detect otherwise. Gum Disease. About 23 percent of 65+ adults have severe gum disease. Gum disease is caused by the bacteria in plaque which can lead to the gums being red, irritated, swollen, and even bleeding. If untreated, gums can pull away from the teeth exposing the teeth to more plaque. Advanced gum disease can destroy the gum, bone, and ligaments supporting the teeth. Dry mouth. About 500 medications can cause dry mouth, including medications for Alzheimer’s, Parkinson’s, allergies, high blood pressure, pain management, and depression. The reduction of saliva in the mouth can contribute to tooth decay and gum disease. If your medication causes dry mouth, consult with your physician to see if there are alternative medications to try or if the dosage can be changed. Dentures. Ill-fitting dentures can cause pain and discomfort when eating. If your loved one has Alzheimer’s or cognitive issues, they might not be able to verbalize their concerns. Regular visits to the dentist can check if dentures are fitting comfortably. What can you do to improve oral health and prevent issues? Use fluoride toothpaste. Fluoride in your water and toothpaste can help to prevent tooth decay. Practice regular oral hygiene. Tooth brushing and flossing can prevent gum disease. Caregivers may need to assist their loved ones with Alzheimer’s or other forms of dementia and ensure that oral hygiene is a part of their regular schedule. Avoid tobacco. Smokers are seven times more at risk for gum disease than non-smokers. Limit alcohol. Alcohol can be a risk factor for oral and throat cancer. Regular dentist appointments. Professional care is necessary to prevent issues and for early detection of cancer. If your loved one has mobility issues or is reluctant to see a dentist, it is still important to get them to the dentist regularly. Some assisted living communities even offer dental home visits. Keep an eye on their eating habits. Ill-fitting dentures and oral pain can affect their food intake. If you are concerned, see your physician and dentist. Modify toothbrush. 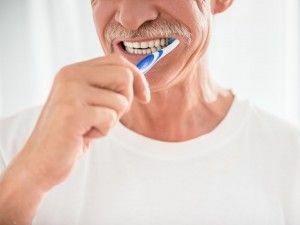 Some conditions, such as Parkinson’s and Alzheimer’s, can make it difficult for the elderly to hold a toothbrush or floss and keep up with their oral hygiene. Try plastic toothpicks and mouthwash. There are several types of toothbrushes to test with your loved one to see what works best–a soft bristled child’s toothbrush, long-handled toothbrush, angled toothbrush, electric toothbrush or try modifying the handle for a better grip. This holiday season, enjoy the bounty of the holidays and indulge in your favorite foods with healthy teeth and gums. Aegis Living wishes you and your family a wonderful Thanksgiving!